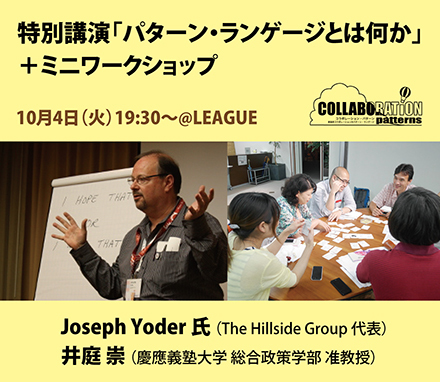 Joseph Yoder氏　特別講演 "What is Pattern Language"
Find a place where you can go by yourself without any trouble, and make sure your family knows about the place too. If you already have such a place, tell your family that it is your “Favorite Place.” If not, find a place such as a coffee shop or art museum near your home that you like, where you feel comfortable. You can ask a friend or a family member to help you find this place. Once you find your place, it would be nice to say hello to the people there so you can get on well early.